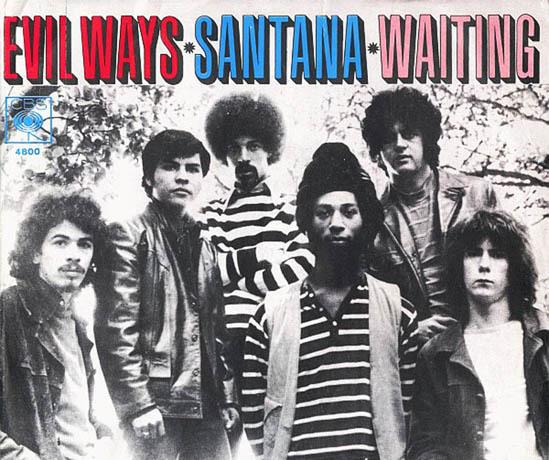 1969 Song of the Day is- “Evil Ways”- Santana. Evil Ways was the first hit #9 on the Billboard charts- off of the first Santana album “Santana” that was released in 1969. Santana was successful right out of the gate with the album going to #4 on the album chart. Oddly the first single from Santana- also on this album Jingo didn’t crack the Top 40- #56. Evil Ways and Black Magic Woman from 1970 would be Santana’s signature songs and their most successful singles until Smooth in 1999. Evil Ways was written by a jazz guitarist and songwriter Clarence “Sonny” Henry and was first recorded by jazz musician Willie Bobo in 1967. Gregg Rolie later of Journey is the lead singer on Evil Ways. The guitar solo which is about 90 seconds long is done of course by Carlos Santana. Great tune! I also dig Jingo. In fact, the first three Santana albums are excellent, in my opinion. I was fortunate to see the classic Santana band a few years ago, after Carlos had gotten them back together and they had released a new album (Santana IV). They played all the old stuff. It was fantastic! Christian, that sounds like it would be a great concert! One of my all time favorite musicians. Top five. I’m giving away a lot but I saw him on the Boston Common in 1972. Song of the Wind from Caravanserai takes me back to that night and still speaks to my heart. Love the man, love his vibe. You were probably only 2 or 3 back then when you saw him right? I need to listen to more.